As easily as kill a moth." "And wherefore should I lend it you?" The battle of the sexes, written from childhood' seeming innocence on has provided humor for many. Here brother and sister trade sibling blows through the wit of Carroll's prose and the constraint of the sensible cook, far more sensible than the cook found in Alice . The original title of the poem is "Brother and Sister." For other settings of Carroll's poems, click here. The wide leaps of ninths flavor introductions and interjections between strophes, while the seemingly innocuous C major gives way to D flat and beyond, and thence G minor before a diatonic last burst of parallelism in the tonic major. The score for Never stew your sister is available as a free PDF download, though any major commercial performance or recording of the work is prohibited without prior arrangement with the composer. 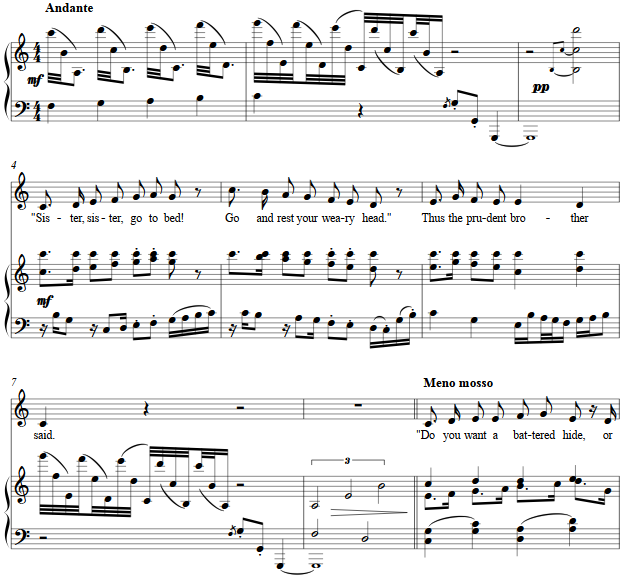 Click on the graphic below for this piano-vocal score.